Sewalot Home Sewalot Index Sewing machine Tension Problems! Frister & Rossmann started life near Berlin, Germany, in 1864 but by 1865 Gustav Rossmann had moved his workshops from Markgrafenstrasse in Berlin to Adalbertstrasse and then in 1868 to Skalitzerstrasse. Luckily they stayed for many years as all that hard spelling takes an age to type. Now let me take you on a tangled journey of one of the most famous names in the British Sewing Industry. 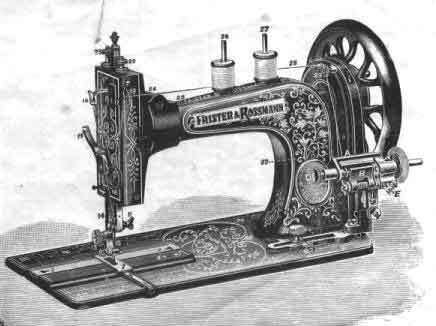 The two business partners, Gustav Rossmann and Robert Frister had started their sewing machine business by copying existing machines such as the American Wheeler & Wilson and Willcox & Gibbs under license from the original manufacturers in America. Frister & Rossmann Model A or No1 Circa 1865 made under licence from Wheeler & Wilson in the USA this machine ran right un until 1909 without hardly a change from F&R. Their first sewing machine, the A1 or No1. It was simply a Wheeler & Wilson clone machine, boy would I love one of those. However its success was unsurpassed, hardly changing for around 50 years of production. Frister & Rossmann model A No1 needleplate info. Actien Gesellschaft apparently that means Public Company, (thanks Betty). The potential for European sewing machines was huge and the wealth of entrepreneurs like Elias Howe and Isaac Singer were well known. They were the Bill Gates of the Victorian age. The only problem with the American machines were that they were across the other side of the world and shipping was time consuming and expensive. European manufacturers had a clear advantage in price. The Frister & Rossmann business grew at an outstanding rate and within a few years, they had produced tens of thousands of hand-built machines. Eventually with the success of their venture, an immense factory grew at Skalitzerstrasse. The factory chimneys darkened the Berlin sky with the furnaces melting pig iron 24hrs a day, seven days a week. 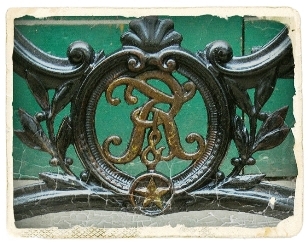 Early Frister & Rossmann machines came with a beautiful ornate cast base, quite rare today. This transverse fiddlebase model is from Skalitzerstrasse circa1879 and is based on the 1865 Singer 12k. For decades Frister & Rossmann were the largest producers of sewing machines in Germany. 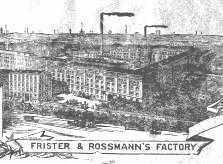 By the early 1880's they had made a staggering quarter of a million machines and by 1903 the great Frister & Rossmann factory company had produced over one million machines. Now we have to slow down because Gustav & Bob were business men as well as manufacturers. They did not stop at sewing machines, they turned their expertise to typewriters and even bicycles, however it would be their sewing machines that lasted the longest. Frister & Rossmann settled down to manufacture high quality sewing machines for many decades. Winning medals in Sydney in 1879, Altona and Crystal Palace, England 1881, Amsterdam, 1883, Teplitz and London again in 1884, Edinburgh, 1886, Adelaide, Australia, 1887, again in Melbourne Australia the following year and the most prized award in their home town of Berlin in 1889. A few of the early Victorian models that were heavily inlaid with mother of pearl and lavish gold work have become very collectible machines. Their most popular late Victorian model was based on the Singer New Family machine model 12k also fondly referred to as the Fiddle base due to its curved casting. 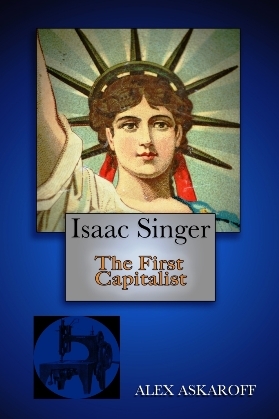 They made their fist copy of Singers model around the early part of the 1870's. How they got around the patent infringements I can only guess unless they, as before, paid a licence fee! They even advertised their machines as the Improved Singer! Cheeky. 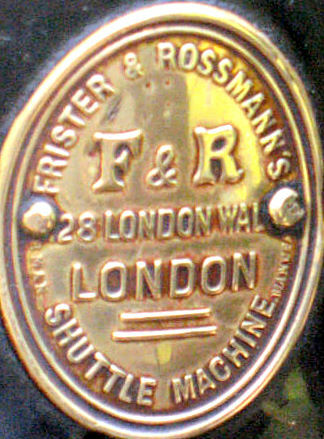 A rare Frister & Rossmann chain stitch click on the image for a better view. The undisputed best selling chainstitch in the world was the Willcox & Gibbs Chainstitch. Now Gustav & Bob, right from the beginning, copied the best machines on the market and they soon turned their gaze toward the pretty bestseller by W&G. Little is known about these rare beauties made by F&R (only for a very short period). Frank Godfrey even surmised that F&R had used some of the first castings made by Clemens Muller of Dresden. The F&R...W&G's chainstitch clones are scarce machines and only a handful have come to light. Because all the models I have seen all have the W&G automatic tensioner brought in in around 1875 we know that the models are post that date. However to add more confusion, all the models that I have seen have very low serial numbers. I can guess that all the Chainstitch F&R machines must have started their production run at zero and not just joined in on the other machine numbering. If they had they would have been much higher numbers. Frister & Rossmann chainstitch machines are as rare as hens teeth today and often confused with W&G's machines. The very earliest imported F&R Chain stitch do not even have the F&R logo on them. However there are manufacturing details that are obvious to a specialist. I shall name a few. Nickel plated fine cast hand wheel assembly, nickel plated lower pulley wheel. Porcelain hand knob. Brass auto tension assembly (not steel) with a centre screw, brass cotton peg, not steel. all the attachments are also brass. The gold work is slightly cruder with different scroll work. The needlebar and presser bar have pear shaped tops rather than round knobs. Smaller base wing nut, larger needle bar clamp nut. You get the idea, lots of minor alterations to fit in with their manufacturing and tools and possibly to avoid possible patent restrictions. And so you have it, a little marvel, rare and sweet. The F&R chainstitch had a short life and quickly disappeared. The odd super-rare machine now turn up in collectors collections. Frister & Rossmann 128 London Wall. Hermann Loog Ltd.
Back to business. The first importers into Britain, that I am aware about, was I. Nasch of whom I know absolutely nothing! German production, while he was importer, rose to over 100,000 machines so he must have sold a few in Britain. He disappears quite quickly and I know F&R were having communication problems with their British importers and agents. So now let's skip to the next fascinating name in our long saga. It was not until Hermann Loog ltd, around 1876, that sales really started to boom in Britain. They traded from 126-128 London Wall, London. I have only seen a couple Loog badged F&R and neither of them had Hermann's name on them just his trading address. Hermann had a troubled personal life. His wife died in an asylum, one son died very young and the other emigrated. He seemed to be plagued with lawsuits, including the giant Singer Corporation. Even F&R had to act against him to protect their interests. Although a workaholic and full of ideas he had a fiery temperament which his family politely called 'difficult' that was not successful in business. When not going bankrupt he seemed to be in court suing or being sued by someone! Hermann allegedly had several sets of books, one special set kept by his son, Robert, for unknown reasons. It all came to a head on the 4th of January 1887 when Scotland Yard tracked Hermann down to a house in Croydon and arrested him. They had been after him for weeks after the German company informed the police that £5,899 had gone astray from the accounts. A massive sum in 1887. They had already caught his son Robert who was banged up in Holloway Prison. The court case was a huge affair lasting days with Hermann Loog being kept out of the witness box as it was thought that if he was cross examined he would end up with a long jail sentence. F&R No1 circa 1870 braiding. Reading from court statements at one point the court burst into laughter when it heard that Hermann had set up another business to transfer sewing machines to his family. The court was read a list of directors which were his children, Robert Loog, Hermann Loog Jr, Otto Loog, Ella Loog and Catherine Loog. The oldest was only 15 at the time of the set up and the youngest was just one! Well, your never too young to become a director! When the court asked what directors fees were being paid they were informed that no directors were receiving payment but they had a nice home by the sea in Brighton to live in! The court burst into laughter again. On a more serious note the sums involved were enormous and the way Hermann ran his business caused a huge rift with the German company who took a long time trusting another importer after replacing Loog. After his split with F&R Hermann worked for a short while with Seidel & Naumann, another German sewing machine manufacturer. However that did not last and he ended up in court...again! Shadowed by constant illness and money problems in later life Hermann took a final step. Hermann wound up his personal affairs wrote a letter leaving his body to science. 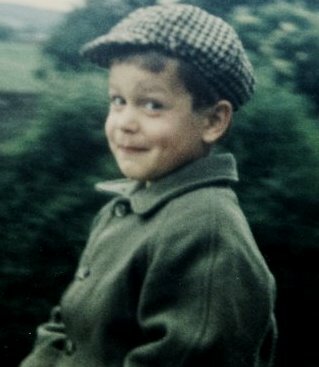 He dressed smartly as if going to church and walked to the cemetery in Croydon where his wife was buried. Unfortunately due to the ridiculous laws of the time his son who had died so young was not allowed to be buried with her as he had not been christened before his sudden death. Hermann chatted to the cemetery gardener, went to his wife's grave, sat on the grass by her side took of his hat and shot himself through the head. He was 59. And so ended a fascinating chapter in the early history of Frister & Rossmann. In the Singer lawsuit, which is a significant precedent in British trademark law, Loog was not assessed any damages for advertising his machine as the "Singer Improved." Second, in the criminal case, Hermann Loog was acquitted as "agent converting property to own use" and discharged; Robert Loog was acquitted of "omitting material partners from book of masters" and discharged. The rest of the story -my grandfather migrated to New York. After Hermann's suicide, Robert Loog migrated to New Orleans. One of his sons, Andrew Loog, was a U.S. bomber pilot, and was killed in action in WWII. I believe that his son is Andrew Loog Oldham. Thanks for that Tom. Now let's follow on with our journey. I told you it was long and complicated! Frister & Rossmann tried handling the machines themselves directly for a while, appointing their own German directors, but that was not as successful or very easy. Basically they were manufacturers not salesmen and after a period they decided to once more trust an agent and to export their sewing machines to them. I expect with much tighter procedures. Later importer’s were S. Lowe & Son of 49 Fore Street London, who had the rights from around 1886 onward. Lowe may have been in business with O Quitman who we shall get to a little later on in our story. If you look back at the top of our page you will see a large F&R advert from Sewing Machine and Cycle News. The year of the magazine was early 1888 and clearly shows S. Lowe of 49 Fore Street as the Sole Agent fro F&R. Also they were selling their machines as Improved Singer and Wheeler & Wilson machines, cheeky! It was not only the colonies where F&R sold there machines. Here is an advert kindly sent to me from Latvia showing the Moeller Brothers in 1897 selling F&R sewing machines and bicycles in Riga. Interestingly Riga and many Baltic provinces spoke mainly German until Russia was made the official language in 1891. Now there is some dispute about this next date. I assume that Lowe & Son sold out to the importers and dealers W. Pierssene & Co, the same year as Queen Victoria died in 1901 but some say it was earlier around 1896. They also imported to 49 Fore Street just East of the centre of London but then moved down the road to larger premises at 25 Fore Street and held the rights up until the outbreak of WW1. 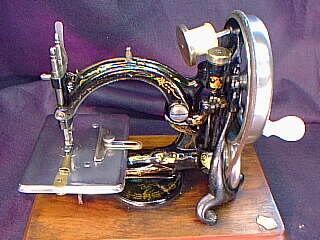 Of course production of sewing machines stopped during the war. We have to wonder what they made instead! You can bet it wasn't anything pleasant...see what I found below. 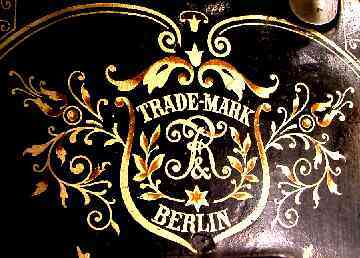 Coincidentally up until the outbreak of the Great War, most Frister & Rossmann machines were proudly marked MADE IN BERLIN, however, after the war, all mention of their manufacturing base was removed. At this time it was normal for a shop to remove the F&R badge to avoid upsetting customers. During this period their machine was know as the Silent Cam Action Improved Lockstitch and took the same needle as the Singer 12, needle 339. Agents such as Heelas Sons of Reading and Goward Brothers in Oakham sold the pre-war German machines but soon switched suppliers to British manufacturers such as Vickers and Jones after the outbreak of war in 1914. If you have a F&R 'looking' machine with no mention as to where it was made and no badge you probably have one of the post-war models. If you have one with no badge just the holes you can almost guarantee it was surplus unsold war stock from Germany. It has recently come to light that Frister & Rossmann changed from Sewing machine manufacturing to weapons! No wonder nobody in Britain bought a Frister &Rossmann machines after 1914! In the following six years production of sewing machines fell dramatically to less than 20,000 a year. 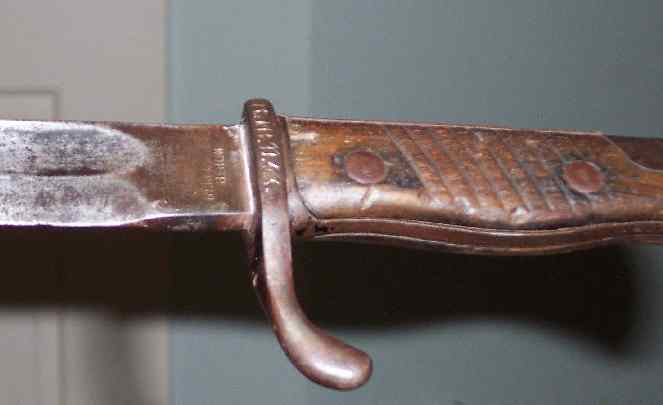 A rare WWI bayonet made by F&R. Poor old Frister's were in big trouble and from 1914 the following years were hard, laying off staff and cutting production. 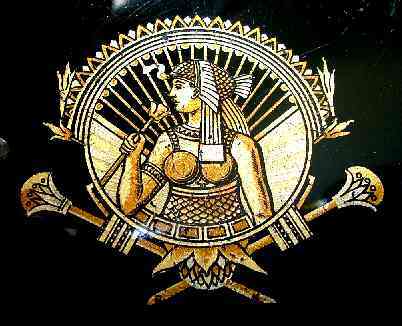 The 1920's were a time of terrible hardships imposed on Germany by her victors and suppressors. The crippling reparations imposed by foreign powers led to the rise of Hitler in Germany and eventually another World War. By late 1924 the great factory that had once been the pride of German manufacturing closed its doors. the last man locked the gates and a period of pioneering history was over. In 1925 Gritzner & Kayser bought the rights to make Frister & Rossmann machines. For a long period all Frister & Rossmann machines were in name only and from the Gritzner factory. But we must go back a step. Now funny things happen with history. Just before the outbreak of WWI, the agent for Frister & Rossmann machines, Pierssene, must have known that importing from Germany, if they went to war, would be difficult if not impossible. Pierssene must have looked around Britain to find another manufacturer to supplement his supplies and keep his market going. 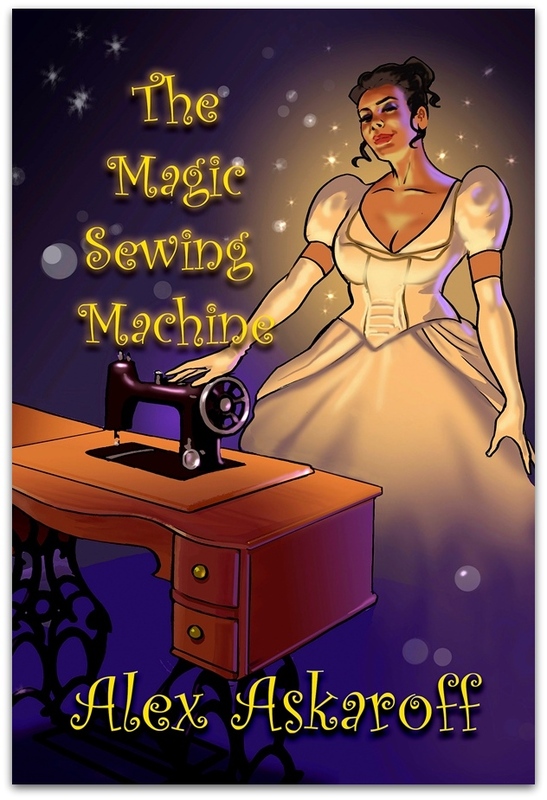 During periods of war and the shortages they bring, sewing machines are in high demand. His eye fell upon one of Britain's foremost manufacturers, Vickers. Vickers made loads of stuff from planes to machine guns, ships to bombers. In the Second World War they helped to produced the amazing Supermarine Spitfire, which along with its Merlin Rolls Royce engine helped save England in its darkest hour. At Vickers handling a sewing machine would be easy and they could see huge potential, (not only during the war but after it as well). By 1916 they were well underway with a copy of Singers model 28 VS machine. A sturdy simple machine basically identical to Frister & Rossmann's own copy of Singers best seller. By 1917 the machines were being supplied instead of F&R machines to shops up and down the country. Frister & Rossmann could not do much about the new competition and Vickers took away a precious market, putting another nail in the coffin of poor old Frister & Rossmann. Now Pierssene, funnily enough, had left F&R at the outbreak of war. An image of industrial espionage jumps to mind of the former importer running off with the plans of F&R's new machine to Vickers. Either way Vickers was here to stay and Pierssene was their sole agent. Note the address on the picture below right, Fore Street London. 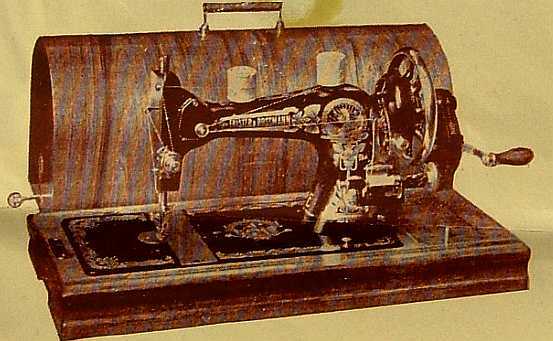 During the 1920's and 30's Vickers Sewing Machines flourished but by the late 1930's demand was so high for armaments they shelved the poor old domestic sewing machine. So that was the end of Vickers from our little saga. The Model E was one of the most popular F&R machines. It's stunning looks and superb performance and quality could not be surpassed. Suppliers and agents like Edward Miller Ltd of Woking, placed orders for the model E in the hundreds each year. Between the wars Frister & Rossmann's most popular machine was the cam action vibrating shuttle. One point of interest is that Frister & Rossmann were one of the first sewing machines that came supplied as electric from new with a Siemens-Schuckert motor and foot control. It clearly states that they were importers from 1884, 30 years before they were supposed to be importing the F&R machines. So what is the answer? Maybe they imported other things besides sewing machines. They did sell sewing machine accessories and furniture before the sewing machines. We shall probably never know when they really took over the machine business. Still they do say...'never say never'. More information may turn up. We know for a fact in 1888, S. Lowe was the sole agent for F&R so what's going on? I assume it is simply stating the start of their business not what they started with! What I do know is that some of the F&R machines sold during the take-over period from Pierssene to Quitmann had a bit of both in them. For example the machines came clearly marked W. Pierssene Sole Agent 49 Fore Street, London. But the needles and accessories in the same machine came packaged from O. Quitmann, Sole Agent 18 City Road, London! So was there a slow hand-over or a collaboration? I am stretching again. Back to more positive information. 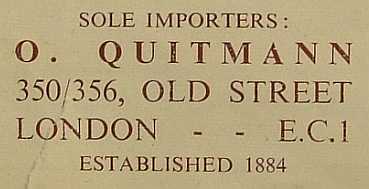 The longest running of all the importers were definitely O. Quitman & Co of 350 - 356 Old Street London, EC1. And 18 City Road, Finsbury Sq. London EC1. You will note that up until 1937 many of the badges had the City Road mark but after that period marked '23-24, Little Britain'. Frister & Rossmann 23-24 Little Britain, London post 1937. Quitman's held the franchise right up until the 1990’s. I should know I used to go and collect my Frister & Rossmann machines personally from Michael Quitman who had a factory in my area in Ghyll Road, Heathfield, East Sussex. At the factory Ben and his assistant would repair machines sent in from all over Britain and Michael would run the office. I use to love it when Ben would ask me for help. One night he arrived on my doorstep with a new model that had a serious design problem. In my workshop Ben came up with a solution and all further F&R models were quickly modified. Several of their more modern machines were design influenced in the 1980's by British designer, Ken Grange RDI FSI. Back in the early days Quitman's also had a depot at 4 -7 Chiswell Street, Finsbury Square, London EC1. At the depot they had a team of skilled mechanics that could repair any machines returned under guarantee. Also they had premises just around the corner at 23/24 Little Britain in Newgate Street London, EC1. After WWII the badly damaged German factories, became part of the Eastern Block in Eastern Germany. 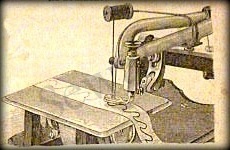 They were unable to produce sewing machines for Quitman's. It was the end of another era. 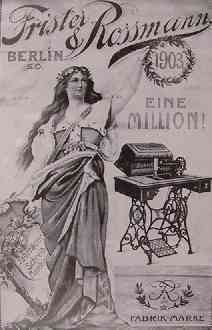 Germany, once the largest manufacturers of sewing machines in the world, had all but ground to a halt. They also had to compete with the emerging countries like, American financed, Japan. 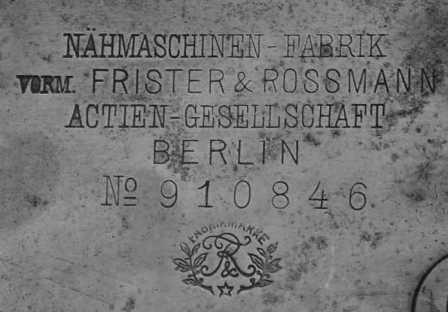 Unable to import machines from Germany around 1945-6, the importers, Quitman’s bought the rights to the Frister & Rossmann name so that they could continue with the brand name. From this point on Frister & Rossmann became a British registered trading name. This allowed the family firm to purchase machines worldwide and still badge them with the famous name that had been around since the early pioneering times. Luckily for us they kept their quality high and sold some superb machines. In Germany the manufacturers of Frister & Rossmann machines had changed, firstly from F&R to Gritzner & Kayser who had bought out the original firm in 1925. They in turn merged and in 1963, they in turn were taken over by giant German manufacturers of Pfaff who produced high quality machines, industrial and domestic. Also I seem to remember that they had some sort of furniture imports, run out of their Bristol depot. 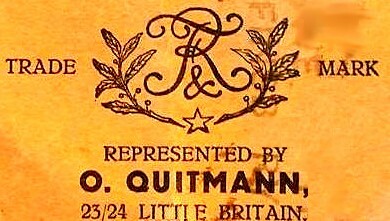 Quitman’s, who owned all the rights to the famous German name of F&R went on to import excellent machines marked with the famous Frister & Rossmann logo from several countries around the world. The Japanese Frister's of the 1980's are still held as some of the finest sewing machines ever produced. The F&R Cub (also sold under the Bernina badge), 500 and the 900 series still produce unbeatable quality when sewing well. The stunning Frister & Rossmann Cleopatra model 50R ran from 1919 to 1939 as the F&R model E and up till 1955 as the 50R. It was possibly the best selling model they ever sold. In 1954 it cost £26, the average wage was around £5. Work out what five weeks wages is today and you have a modern cost of this beauty! Eventually, in the 1990's, the last family member in Frister & Rossmann, Michael Quitman, retired and we said goodbye to one of the longest running families in the sewing business. Michael and I had many meetings and conversations over the years and he was a pleasure to do business with. The Business then passed to Michael Orr (who had worked within Frister & Rossmann for many years). 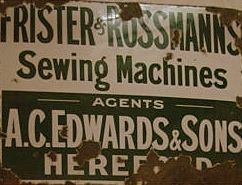 He kept the Frister & Rossmann name alive and continued to sell a selection of fine sewing machines from their head office in Bristol. 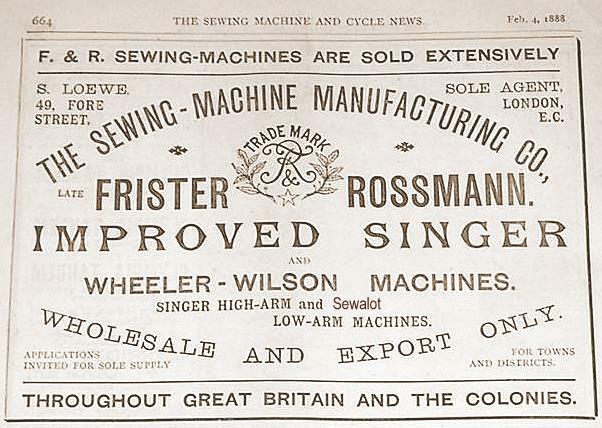 In 2005 Frister & Rossmann passed to new owners Russell Forester and Mike Brooks, Sewing Machines Direct. In 2008 the F&R brand name has passed to Jerry Fried based in Gateshead. Mike still handles the parts for F&R and Juki domestic models. Frister & Rossmann machines are know world wide and similar models are better know in Australia & New Zealand as The Globe and America as Jaguar and Kenmore machines. Frister & Rossmann continues to hold it place amongst the premier sewing machines names in Great Britain. Values of the early F&R machines vary greatly. The 1870's Howe clones fetch good money and the Chainstitch models are so seldom seen that you cannot put a figure on them. The last one I saw sold for $500 and it was not in great condition. After that it is all about condition. 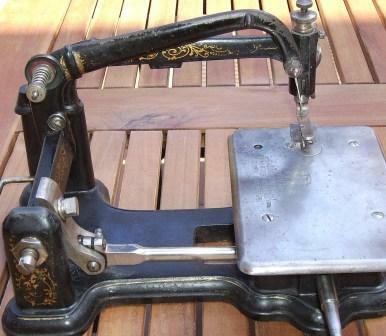 a beautiful condition 1880's machine with mother-of-pearl inlay will go for excellent money. Most models after The Great War do not sell as well as they look a bit to plain and industrial. Ebay prices vary, so if you see an early model grab it while you can. Don't forget all machines (to my knowledge) marked Made in Berlin were prior to the Great War period. I doubt if they will reach their original cost when they were new (£1300 in new money). So they are a great buy. Remember one final thing! Nothing lasts like quality! The engineering of the early Frister & Rossmann machines was simply unbeatable. If you find a nice early F&R it will give you a lifetime of happy sewing, a million smiles and only go up in value. News Flash! 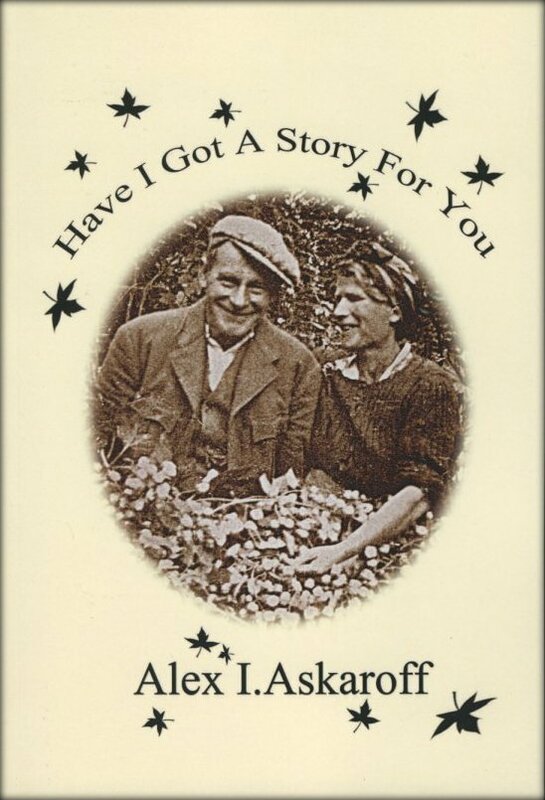 Alex's books are now all available to download or buy as paperback on Amazon worldwide. "This may just be the best book I've ever read." "My five grandchildren are reading this book aloud to each other from my Kindle every Sunday. The characterization is great; both heart-warming and funny, and the story never lags. I enjoyed not only the story, but watching my grandchildren's delight in hearing it. The illustrations are the best I've seen in a very long time. If this isn't the perfect book it's close to it! I'm on my third run though already. The way it's written you can just imagine walking beside him seeing the things he does. Definitely look forward to reading more of his adventures. I just wanted to let you know how much I thoroughly enjoyed your website and will continue to do so. Thank you. Congratulations on your blog about Frister & Rossmann sewing machines. I thoroughly enjoyed your style of Frister & Rossmann history telling and appreciate all of the time you must have spent researching this amazing collection of info! Your mischieveness picture at the end is a hoot. Thank you for a fascinating insight into my old beauty.